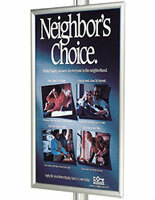 Snap Frames : A snap frame like this clip frame can hold a large, 22" x 56" poster! Clip Frame: 22" x 56"
This clip frame is a key component in the BRAVA and Forte display accessories lines. 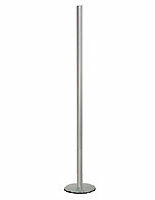 The lines of accessories includes a banner pole that features two adjustable tracks on either side. This allows you to feature your clip frame and other display accessories at the desired height for your retail store. This clip frame slides into the track, and can be featured with another 22" x 56" snap frame back to back. A poster holder, snap frame or sign holder like this clip frame is a great addition for these modular retail displays. The clip frame, sometimes called a snap frame, has become extremely popular for its ease of use, and stylish look. Add other display accessories to your clip frame for a versatile retail display. The attractive aluminum finish and easy non-glare lexan plastic showcase your sale posters beautifully in a vertical easy-open frame hung on the banner pole. 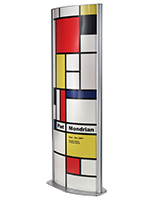 Many products are available for this banner pole accessories line, including clip frames, literature pockets, banner rails, and customizable headers. 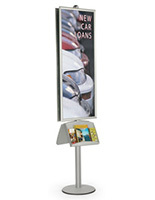 These clip frame accessories make a striking advertising focal point at any trade show, showroom or place of business. Buy multiple display accessories like this clip frame to promote sale posters in your store with stunning results. 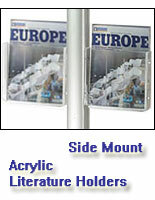 A sign holder or poster frame such as this clip frame can accommodate a large 22" x 56" advertisement. Note: allow ½" border around your print for the clip frame edges, making the viewable area approximately 21" x 55". This clip frame is ideal for ever changing retail posters. The sales images can be changed often with the easy front-loading frame design. These clip frames are ideal for maps, advertisements and long, hard-to-fit posters. There is no need to fuss with a complicated poster holder, poster frame, or other sign holder any longer. Clip frames are the only poster holder products you'll want to use. Simply snap open the well-built aluminum poster frame and load your posters. Viewable area: 21" x 55"